Here's a random question. Does anyone know if it matters what type of beer to use? Can you use the cheap stuff for cooking and the good stuff for drinking? Or, should you use the good stuff for both? I personally drink Killians and my whole family loves beer can chicken made with it. My brother however only drinks bud and says the only good use for Killians is cooking beer can chicken. A lot of cheap beers tend not to have a lot of flavor. I watch a lot of food network and all the cooks on there say not to use cooking wine. Use wine that you like and you will like the flavor better. I think this also applies to cooking with beer. Besides you get to drink at least half the beer anyways. Beer boils at around 212 degrees, but the alcohol evaporates at a much lower temp. I do mine quite different. I then place the beer in the chicken breast side down with the holes in the can pointing up. I make a foil bowl to not loose those flavorful juices. Then I smoke for 4-5 hours , the last hour I flip the bird . letting what is left of the beer rush out over the breast. Home made lunch meet for this week. Whole chicken brined and herbed overnight, marinated in Zesty Ranch for 3 hours, smoked for approx 2 hours at 250� with cherry wood. Carcas boiled down for what will be some outstanding smoked chicken soup. How good is it with a coke? Okay, here it is. The master recipe for the beer-can chicken, the showstopper that will dazzle your family and friends. If you�ve never made beer-can chicken before, start here, and once you�ve mastered the basic procedure, there�s no limit to its variations. Pop the tab off the beer can. Pour half of the beer (3/4 cup) over the soaking wood chips or chunks, or reserve for another use. If cooking the chicken on the can, using a church key-style can opener, make 2 additional holes in its top. Set the can of beer aside. Remove the packet of giblets from the body cavity of the chicken and set aside for another use. Remove and discard the fat just inside the body and neck cavities. Rinse the chicken, inside and out, under cold running water and then drain and blot dry, inside and out, with paper towels. Sprinkle 1 teaspoon of the rub inside the body cavity and 1/2 teaspoon inside the neck cavity of the chicken. Drizzle the oil over the outside of the bird and rub or brush it all over the skin. Sprinkle the outside of the bird with 1 tablespoon of rub and rub it all over the skin. Spoon the remaining 1 1/2 teaspoons of rub into the beer through a hole in the top of the can. Don�t worry if the beer foams up: This is normal. If cooking on a can: Hold the bird upright, with the opening of the body cavity at the bottom, and lower it onto the beer can so the can fits into the cavity. Pull the chicken legs forward to form a sort of tripod, so the bird stands upright. The rear leg of the tripod is the beer can. If cooking on a roaster: Fill it with the beer mixture and position the chicken on top, following the manufacturer�s instructions. Tuck the tips of the wings behind the chicken�s back. Set up the grill for indirect grilling and preheat to medium. If using a charcoal grill, place a large drip pan in the center. If using a gas grill, place all the wood chips or chunks in the smoker box or in a smoker pouch and preheat on high until you see smoke, then reduce the heat to medium. When ready to cook, if using a charcoal grill, toss all of the wood chips or chunks on the coals. Stand the chicken up in the center of the hot grate, over the drip pan and away from the heat. Cover the grill and cook the chicken until the skin is a dark golden brown and very crisp and the meat is cooked through (about 180�F on an instant-read meat thermometer inserted in the thickest part of a thigh, but not touching the bone), 11/4 to 11/2 hours. If using a charcoal grill, you�ll need to add 12 fresh coals per side after 1 hour. If the chicken skin starts to brown too much, loosely tent the bird with aluminum foil. If cooking on a can: Using tongs, hold the bird by the can and carefully transfer it in an upright position to a platter. If cooking on a roaster: Use oven mitts or pot holders to remove the bird from the grill while it�s still on the vertical roaster. Variations on this rub have appeared in each of my barbecue books. There are four basic ingredients-salt, black pepper, paprika, and brown sugar-and by varying the proportions you can create an almost endless variety of flavors. For a spicier rub use hot paprika instead of sweet paprika. You could also substitute granulated sugar, light brown sugar, or Sucanat (powdered evaporated sugarcane juice) for the dark brown sugar. There isn�t a fish that swims, a bird that flies, or a beast that walks that wouldn�t benefit from a generous sprinkling of this multipurpose rub. Store the rub in an airtight jar away from heat and light; it will keep for at least 6 months. I used Everglades Seasoning but next time I will just do something differnt, the skin taste had no flavor other then the huge smoke flavor, I def need to cut the smoke down but 80% I wanted a light smoke flavor with the rub on the outside and then a injection on the inside but I will inject from the inside and not to poke holes on the outside so I don't dry the inside of the chicken out. I'm also going to spray with a mix of Beer & Apple Juice. First, take a thawed, whole, raw chicken. Rub it inside and out with olive oil http://tassos.com/products/tassos-olive-oils and kosher salt. Then, get some Lawry's marinade (your choice of flavor) and strain it through a wire mesh strainer. After straining, use an injector to inject the marinade into the bird at various places. Place a can of beer (half-full) inside the chicken (be sure and keep it upright!) Cabellas has special holders to hold the beer can chicken in the upright position. If you don't have one, just set the chicken with the beer can inside of it on a plate. Rub Emeril's Essence seasoning all over the outside of the chicken (be liberal!) Carefully remove it from the plate, taking care to keep the beer can inside the chicken. Position in smoker. Smoke with hickory chips at 350 degrees for about 2 hours. It's hard to keep the temperature steady so you have to really watch it. An alternative to beer is Mountain Dew, Squirt, or any lemon-lime flavored drink. Hope this wasn't too long-winded! I do drunk chicken - sittin' chicken, as I call 'em - ALL the time. I have a pair of Sittin' Chicken cookers, they are just like the metal ones you stick a beer or coke can in, but they are ceramic and hold a lot more. Plus, no can to cut open. Here's a pic. 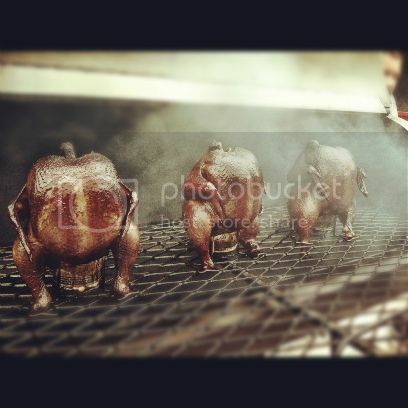 Posted: Tue May 27 14 1:03 pm Post subject: Beer Can Chicken Rocks! SO many killer ideas for beer can chicken here. Thanks guys! I have made beer can turkey, duck, game hen, chicken and goose. Goose is dangerous! That grease is like gasoline. Flame on!! Anyhow, just joined up but also blog about this, see my www button at the bottom of my post. Ill be back tomorrow to posts some pics from a smoked beer can chicken I carved up last summer! The Beer Can Chicken Blogger runs a blog about...you guessed it -- Grillin' Beer Can Birds. Ducks, Geese, Game Hens and Chickens.